Dominique was the dominant female XC MTB racer (1991 MTB National team) and cyclocross racer in Eastern Canada in the late 80’s and early 90’s, racing for Trek USA and Rollerblade Canada. With a propensity for boredom and collaboration, she redirected her passion for speed to inline and marathon speed skating racing in 1992, where she quickly became the dominant force in Canada and the US. She proved her international status in marathon speedskating during the Finland 100 km Ice Marathon in Kupio and the Athens to Atlanta marathon in 1994. She won the national inline skating title in 1996, prior to her retirement, declining an invitation to train on ice in Calgary in preparation for the 1998 Nagano Olympics, choosing family, education and vocation over racing. Her coaching debut took place at Camp Fortune in 1997 alongside her studies, combining Gestalt psychotherapy, energy healing and a master’s degree in Sport Psychology at the University of Ottawa (1997-2004). In 2003, she decided to relocate her mountain bike school in Val-des-Monts to design a training facility that would guarantee the holistic success of her students an her full attention to her call as a coach and program/trail designer. 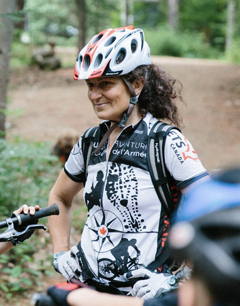 She is fully dedicated in establishing her private coaching practice, her mountain bike school and her summer residence for many years to come in the Amik Forest. During the winter, she consults or works in the hospitality industry, which she loves with all her heart, for living, loving and learning are Dominique’s guiding life’s principles. Her highly individualized and ‘out of the box’ coaching philosophy highlights the symbiotic relationship between mind, body and emotions. With the eye of a Jedi master, there’s not much she misses in her athlete’s riding style and psychological gridlocks. Dominique has developed a solid reputation through the years working with riders of all ages and riding abilities. Her dedication to her students is heart felt in every session she leads. Passion lives here! Olivia Robinson is the lead trail builder and assistant director of the Boulder Outdoor Leadership Program™. This spring, she completed her undergraduate degree in Human Kinetics at the University of Ottawa and is currently in the process of establishing her practice as a kinesiologist, as she is harmonizing with the natural landscape in the forest gym at LaroccaXC. Olivia hails from Northern Ontario, her roots lie in the Boreal forest, on the Canadian shield. Daughter of a social worker and geography teacher, her parents have influenced her approach in kinesiology. Thus, her health intervention philosophy stems from a socio-ecological perspective. She grew up swimming competitively and played a multitude of school and recreational sports. As a teen, she developed an interest in social justice, and embarked on a Me to We trip to Ghana at the age of 16. Her increased awareness of the social and ecological injustices led her to pursue initiatives upon her return through the Me to We club in her school. Furthermore, she participated in Me to We’s Advanced Facilitation Training in Patagonia, Arizona; where she developed skills to facilitate leadership modules using inclusive principles. Her deeply rooted passion for the outdoors led her to working in the silviculture industry as a tree planter throughout the summers of her undergraduate studies. After planting upwards of 300,000+ trees, she is phasing out of building forests for toilet paper, and is now focusing on building and maintaining sustainable trails in the Amik Forest. As the lead trail builder, her role is to be an active ambassador of the Leave No Trace sustainability model, as she will share these practices with those who come to experience the forces of nature in the Amik Trails. Olivia has experienced first-hand the power of the Boulder Outdoor Leadership Program. Her journey as a Boulder began in 2015 when she participated in a mountain biking retreat for teenage girls. She continued to evolve as a Boulder in the following 4 years, leading her to completing her undergraduate degree internship with Creative Wheel. Being a mentoree in the Boulder program has challenged and empowered Olivia’s creative endeavors in poetry, forest filmmaking, and entrepreneurship. The program has fostered her transition from organized sports in high school to XC fitness through mountain biking, trail running, snowshoeing, and skate skiing. She is excited to mentor the Boulders this summer, and hopes to spark leadership in the 3 As of the Long-Term Athlete, Artist, and Agent of change Development (L.T.A.A.A.D.). 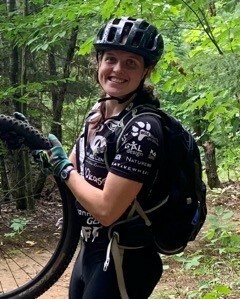 Coach Olivia looks forward to sharing her love of the forest and fitness with everyone she encounters on the Amik Trails!